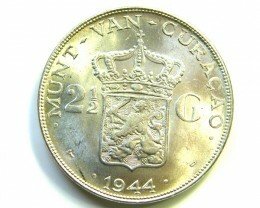 The currency of Curacao until 1829 was the reaal. Between 1799 and 1815, 12 reaal were equal to a Spanish dollar being 8 reales and from 1815 until 1828, 15 reaal were equal to a Spanish dollar. 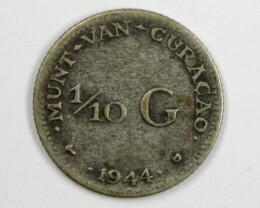 Many of the coins were produced from overstamped or cut Spanish or Spanish colonial coins. 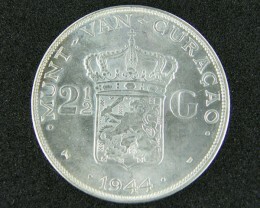 In 1828, the reaal was replaced by the Dutch gulden at the rate of 3â…“ reaal = 1 gulden. In 1801, 9 stuiver coins were issued, made by stamping “9” on Spanish colonial 1 real coin. In 1810, quarter cut 8 real coins were stamped with a five-petalled flower to produce 3 reaal coins. In 1815, fifth cut 8 real coins were also stamped with a five-petalled flower to produce smaller 3 reaal coins. In 1818, fifth and third cut 8 real coins were stamped with “3” and “5”, to produce 3 and 5 reaal coins. 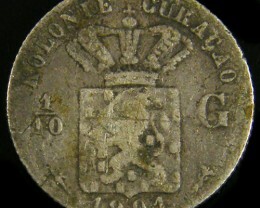 Issue of the 3 reaal coins continued until 1825. In 1821, silver 1 reaal coins were struck, followed by 1 stuiver coins in 1822. After the introduction of the Dutch currency, the 1 stuiver coins were again struck in 1840 and 1841 the date was not changed at all and circulated as 2 cent coins.